Early this month, Victoria’s Public Transport Minister Jacinta Allan unveiled 5 new and exciting Melbourne landmarks. Expected to be operational in 2025, the $11 billion Metro Tunnel Project links Melbourne’s west and south-east with 39km of underground rail through the heart of the city. Touted to increase the peak capacity by an additional 39,000 passengers each rush hour, the project will allow more trains to travel in and out of the city on the busy Sunbury, Cranbourne and Pakenham lines. The five new stations, including three in high-capacity areas which are currently not serviced by rail, are expected to improve the reliability of rail services and connectivity. The revealed designs reflect a strong connection with the neighbourhoods in which they’re located; a conscious decision by the collaboration of architects Weston Williamson, Hassell and Rogers Stirk Harbour and Partners. "Having distinctive features built into the design of these new underground stations will make interesting places for people to come as well as a great place to catch a train from," Ms Allan said. "These new underground stations obviously have to work well from a passenger point of view — we need to make it easy for people to access these stations and to move around the train system. "But we also recognise there's a special and unique opportunity to create new landmarks with these five new underground stations and that's why a lot of effort, a lot of thought, a lot of time and energy went into the design of these five new underground stations,” she said. Located beneath St Kilda Road with an entrance leading to the Shrine of Remembrance, this rail link will relieve pressure on the St Kilda Road tram corridor while offering a functional train/tram interchange. The design is dubbed a ‘pavilion in the park’ and features a large canopy above the interchange which will provide protection in all weathers while flooding the concourse underneath with natural light. Situated between Flinders Street and Collins Street, running beneath Swanston Street, Town Hall Station will include seven access points to City Square, Federation Square, Flinders Street, Swanston Street, Cocker Alley, Scott Alley and the Degraves Street subway. The new station has been designed to maximise community spaces and evenly distribute foot traffic between the famed local laneways. 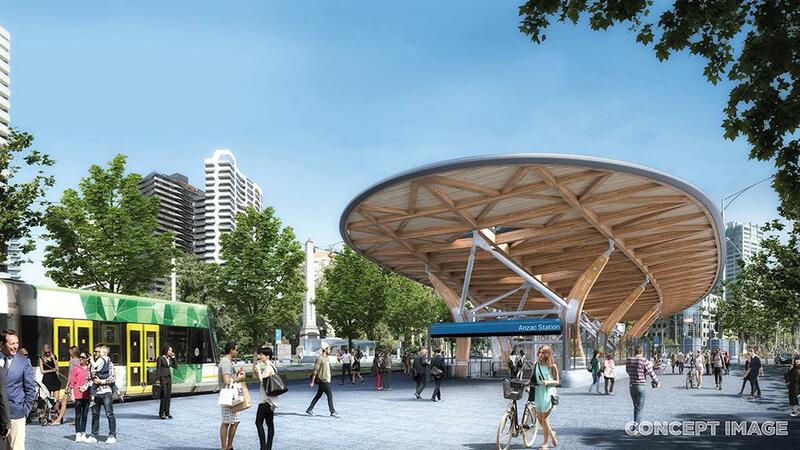 Expected to be recognised as the ‘northern gateway’ to the CBD, the State Library Station has been designed to shoulder the increasing numbers of pedestrians, cyclists and inner-city residential community which frequent the area. Located just across from the State Library of Victoria (on the corner of Swanston and La Trobe Streets), the new station should ease congestion for those heading to RMIT, the State Library, Queen Victoria Market and the Melbourne City Baths. 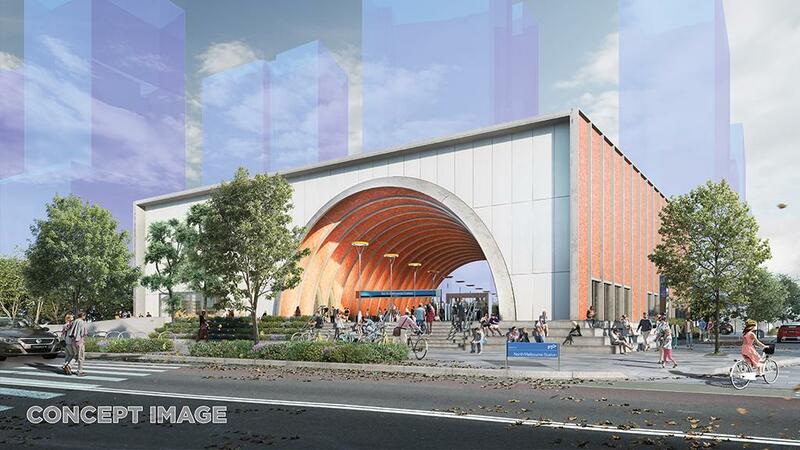 Named according to its geographical location (the current North Melbourne Station will be more accurately renamed West Melbourne), the new station will feature a great clay brick arch, a café and wide public spaces for communal gatherings.